Eileen Rutherford waits to see how her stomach handles the plain naan before taking a second bite. BLOOMINGTON, MN—Characterizing the experience as "different," local grandmother Eileen Rutherford, 78, ate Indian food for the first time Saturday. Although Rutherford was initially reluctant to try the cuisine, she was persuaded by her visiting grandchildren Melissa, Brandon, and Allison, who told the septuagenarian she needed to "expand her horizons." 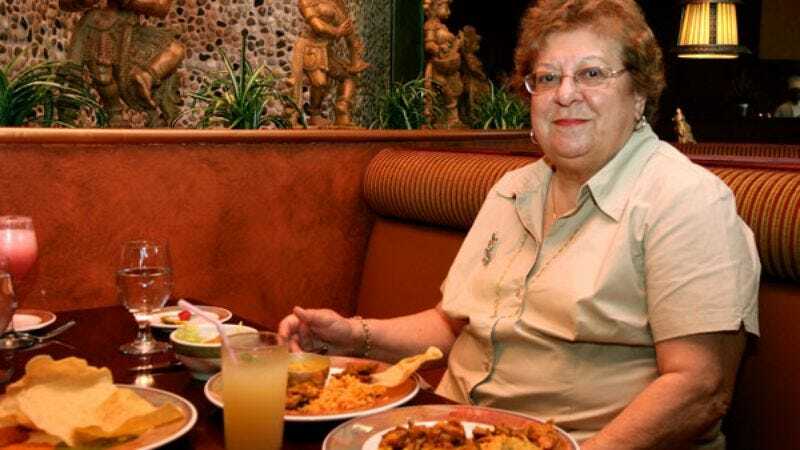 "I couldn't believe that she had lived through three wars and the Great Depression and never even tasted Indian food once," said Rutherford's eldest grandchild Melissa, 22. "I was like, 'Grandma, you've got to try it. It's so good.'" Brandon, 19, made further entreaties, convincing a skeptical Rutherford that Indian food "has lots of sauces, sort of like spaghetti sauce" and repeatedly assuring her that she would like the bread. After Rutherford's offer to instead make cold-cut sandwiches for everyone was rebuffed, she relented and accompanied her grandchildren to the nearby Bombay Delights restaurant. "She only lives two blocks from the place, but she never went in there," Allison, 20, said. "That's just sad." According to Melissa, upon entering Bombay Delights, Rutherford seemed apprehensive about the restaurant's Hindu-themed décor, sitar music, and Indian people. Rutherford did, however, offer a positive comment on the table's elegantly arranged red linen napkins, saying, "These napkins are very nice." Rutherford's attempt to order food was mired by several setbacks, including a struggle to locate her reading glasses and an assertion that she did not know what anything on the menu meant. Despite Allison's best efforts to explain that the entrée selections were clearly divided into sections by types of meats, seafood, and vegetables, Rutherford encouraged her grandchildren to "go ahead and order" for her. Witnesses reported that Rutherford seemed overwhelmed by the unusual aromas upon receiving her first course. She appeared delighted, however, after she cut into the deep-fried pastry shell of a samosa and a recognizable pea rolled out. Rutherford went on to talk about peas for 15 minutes, including an anecdote about how she enjoyed shelling peas from their pods when she was a little girl. "It's cool that we were able to get Grandma to experience a whole new set of flavors and textures," said Brandon, adding that it was gratifying to see his grandmother sample coconut chutney and dum aloo vindaloo. "Now that she's tasted Indian food, I wouldn't be surprised if she starts coming here all the time." "And the look of awe on her face when they brought out the fluffy poori bread was so cute," he added. "When we deflated it with a fork, she just smiled." Rutherford's grandchildren said the highlight of the evening was watching in giddy anticipation as Rutherford took her first bite of the main course, an authentic goat curry dish. According to Brandon, Rutherford raised her eyebrows slightly, silently nodded several times, then took a sip of water. For the remainder of the meal, Rutherford, who had never consumed goat meat before, ate primarily rice and plain naan. In a statement given after the meal, Rutherford described the entrée as "just a little too flavorful." "They put an awful lot of spices in there," said Rutherford, adding that she liked the sweetened "little ball things" they had for dessert. "It was very unusual." Following the completion of the meal, the Bombay Delights waiter asked Rutherford how her food was, to which she responded that it was "nice to spend time with [her] grandchildren." After leaving the restaurant, Rutherford returned home, made herself comfortable in her favorite chair, covered herself with a blanket, and ate tuna straight from the can.